This dish is almost unique to our local cuisine (Malay and Nonya). It is hard to imagine that the pineapple fruit can be paired with something as savoury as sambal. And to that, something from the sea like prawns do sound strange to those foreign to our cuisine. But this sweet-sourish-spicy combination is amazingly appetising and goes very well with rice. And I should add, especially so if eaten with hands! You need to start with pineapples which are not too ripe or sweet. This allows for a longer cooking time, for the sauce to be fully absorbed into the pineapple flesh and for the fruit to be succulent and still firm when cooked. Eventually, the pineapple will be sweet anyway as sugar is added. Using canned pineapple is a poor substitute but this may be unavoidable if you can't get fresh pineapple in your area. Any size of prawns will work well. 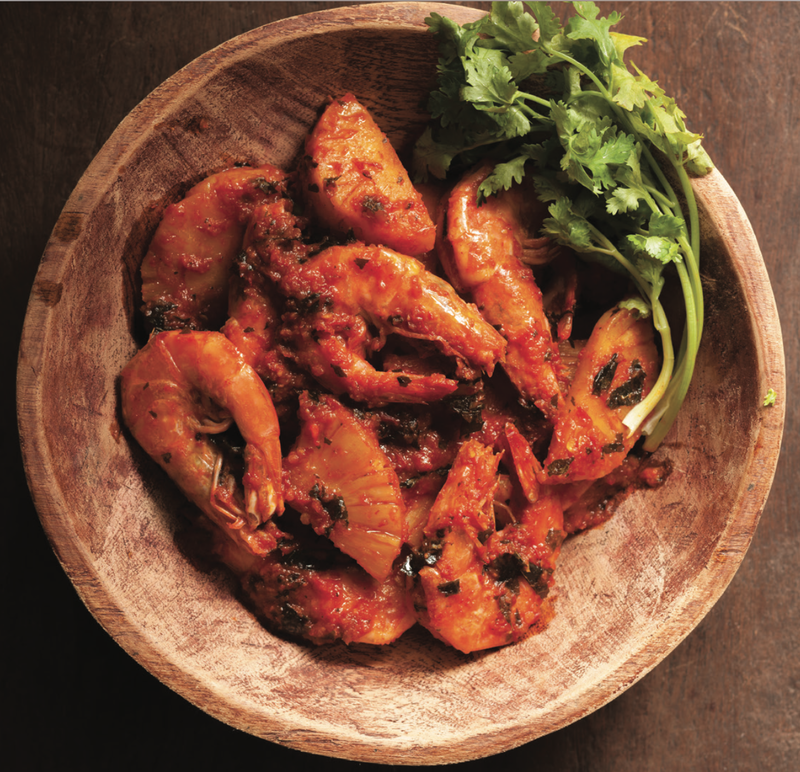 You can also omit prawns altogether as sambal pineapple itself makes a very good side dish. Slice the pineapples into 1 cm (0.4 in) thick rings and quarter each ring. Prepare the prawns, trimming off the legs and hairs. If you are using large prawns, slit the back of the prawns. For easier eating, you can also peel off the middle shells. Pound or blend together the spice paste ingredients. Toast the belacan in a dry pan or wok. Add the oil in a wok or claypot and heat it up. Put in the blended ingredients, belacan and lemongrass bulbs and simmer over a gentle flame for about 10 minutes. Add the pineapples and stir fry for a minute. Season with salt and sugar. Pour in the water and simmer for 15 minutes or till the pineapple is cooked. It will look translucent and soften when cooked. Turn up the heat, add the prawns, and stir briefly to mix. Cover the wok or claypot and switch off the fire. The dish is done after 2 minutes. Garnish with coriander leaves and serve immediately. Serving it with rice is a must. You can also serve it with some heh kou (dark prawn paste - see pic below). It can also be served as one of the dishes in Nasi Lemak. Photo note: It looks drier in the plated photo. This dish can do with more watery sauce as it is tasty when eaten with rice. In the cookbook (page 103), I recommended 100 ml but I do sometimes add more water, as listed in this blogged recipe.